For information about the NARHA / EFMHA integration, please click here. Correction: Kristin McGraw is chair of the Driving Certification Sub-committee, not Corie Brooks as was stated in the last issue of NARHA News. The changes to the leadership of NARHA's committees and task forces are listed below. Members can view NARHA's committees, task forces and work groups, the chairs, members and staff liaisons through their personal accounts via the NARHA website. Log in, click "My Account" and then select "Committees Leadership" from the left-hand menu. As a reminder, center renewals were due December 31. A $50 late fee will be assessed to centers that renew after January 15, 2011. The 90-day membership renewal grace period began on January 1, 2011. If you are renewing your center membership online, be sure to send in your instructor report. The membership department has received many online renewals but only a handful of instructor reports. Your center will be considered non-compliant if the instructor report is not received in the NARHA office by January 15. NPR recently aired a story on the use of cognitive rehabilitation therapy for veterans and soldiers with traumatic brain injury. Click here to read or listen to the story. Equines and equine therapy can be a helpful part of cognitive rehabilitation therapy, and Chastain Horse Park, a NARHA Premier Accredited Center in Atlanta, GA, was mentioned in the story. While doctors and studies -- as well as testimonies from the soldiers themselves -- have shown that the therapy helps, the Pentagon's primary health plan will not cover the treatment. This story is part of a three-part series on NPR's investigation into Tricare, the Pentagon's health plan for soldiers and seriously wounded veterans. 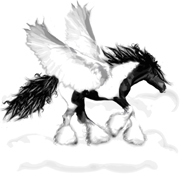 has announced the opening of applications for the next Gypsy Angel, Applications will be accepted January 1 through February 15, 2011. Applications are open to any and all applicants, for all types of therapeutic programs. It is with great enthusiasm that the NARHA Equine Specialist Certification Subcommittee and the NARHA staff announce the Equine Specialist in Mental Health and Learning Certification. Equine-Facilitated Learning and Equine-Facilitated Psychotherapy are rapidly growing fields, and this certification is meant to improve the experience for all involved. A lot of hard work has been done by the Equine Specialist Certification Subcommittee to respond to the need of the growing mental health field within NARHA. The Equine Specialist in Mental Health and Learning certification certifies an individual as the horse handler in any un-mounted mental health or learning session. If the session is mounted, a NARHA certified instructor will continue to supervise the activity. Please visit the NARHA website for a copy of the certification booklet and complete details on the requirements of the certification. The pilot for the first horsemanship skills test will be held in Florida in February in conjunction with the NARHA Equine Specialist in Mental Health and Learning workshop, both of which are required to gain certification. If you are interested in attending the pilot, please contact the NARHA office or click here to download the application. Many of our NARHA members are already preparing for the new certification and have long awaited its release. A big thank you to all for your patience and excitement! Contact Tara McChesney, (800) 369-RIDE (7433), ext. 114, with questions regarding the Equine Specialist in Mental Health and Learning Certification or the workshop. Equine Specialist Workshops: Please join us in celebrating the release of the Equine Specialist in Mental Health and Learning certification. NARHA would like to accommodate individuals eager to be certified by holding more workshops and practical horsemanship skills tests. Please help us get workshops scheduled for 2011! Workshops will now be offered with the new Equine Specialist in Mental Health and Learning practical horsemanship skills test if the host site chooses. Host sites can also host the practical horsemanship skills test without a workshop if they wish. This skills test is a requirement for certification.